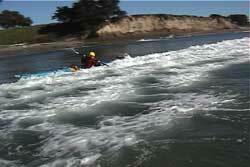 Understanding the forces in the surf zone is a critical element for padding in it. 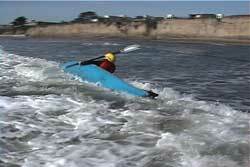 See USK article, "Launching A Kayak Through Surf", for a brief explanation of those forces. 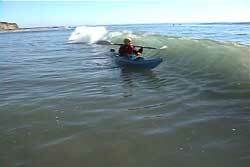 Whether your goal is to play in the surf zone or just get through it, I firmly believe a paddler must learn how to take a "side hit" by a whitewater wave and a breaking wave if they plan to enter a surf zone. 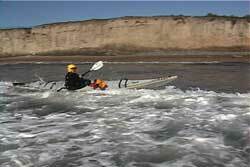 Sooner or later a paddler will find themselves in the surf zone with their kayak parallel to an oncoming wave. 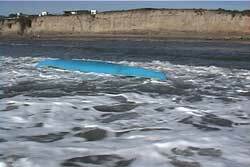 Of all of the forces you will encounter, the side hit is the one that causes the greatest number of capsizes. 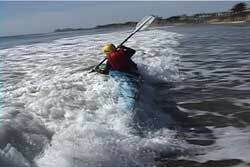 Once your kayak is knocked out from underneath you, you will find yourself capsized toward the wave. This is where the brace comes in. You can choose to use a high brace or a low brace. The choice is yours and there are advantages and disadvantages to either. See USK article, "High Brace And Low Brace Blade Mechanics". 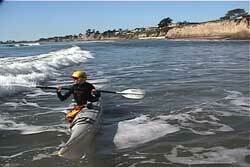 In these examples, all of the paddlers have chosen to use a high brace. Here is a good time to review shoulder safety. It is worth your while to read USK article, "Shoulder Safety". I like to play a little game when I get hit by a wave when broached. 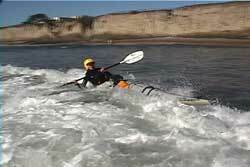 After the hit, I get back over my kayak and try to lift my paddle off of the whitewater, while maintaining my edge. I always try to err to the side of the wave. This way, if I lose my balance I can still brace on the wave. 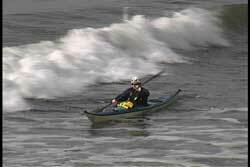 I try to find that sweet spot, where the amount I edge my kayak is perfect for the force pushing it and my bracing blade is just a couple of inches above the whitewater. If I loose that sweet spot, my blade is in position to provide me with support until I find that sweet spot again. When you get in shallow water you will be almost upright. How and what you do next is dependent upon your landing strategy. 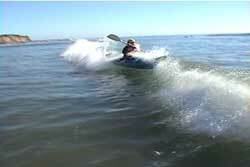 See USK article, "Ride A Wave And Side Surf Combo". 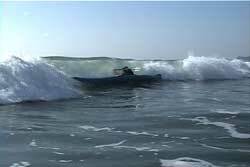 I have often heard instructors tell students, "in order to stay up right when hit by a wave from the side, you must brace into the wave". The basic concept of this statement can be true ,but I find this statement not only misleading, I find it over simplifying a intricate movement. It is a very poor set of instructions when you say, "just brace into the wave". 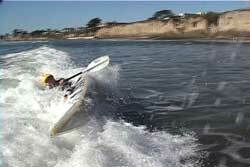 As we have seen, edging your kayak is what keeps you from being rolled over by the side hit. The bracing into the wave keeps you from falling over towards the wave, AFTER your kayak was knocked out from underneath you. 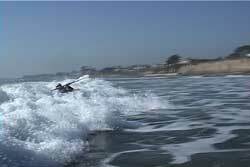 Even though I believe successfully managing a side hit is the most important skill to have when entering the surf zone, it is only one aspect of surviving the surf zone. 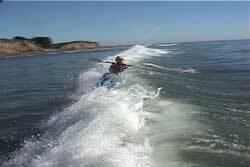 Timing, strategies, quality strokes and control are also necessary to have when you choose to paddle your kayak in a surf zone. See the following USK articles for more information.